A while back, I was planning things for one of my best friends baby shower. I stumbled across a thank you card that I sat aside because I knew I could duplicate it. Well, that is what I attempted and even though it is not exact or perfect, I am in love with this little card and think it's adorable. 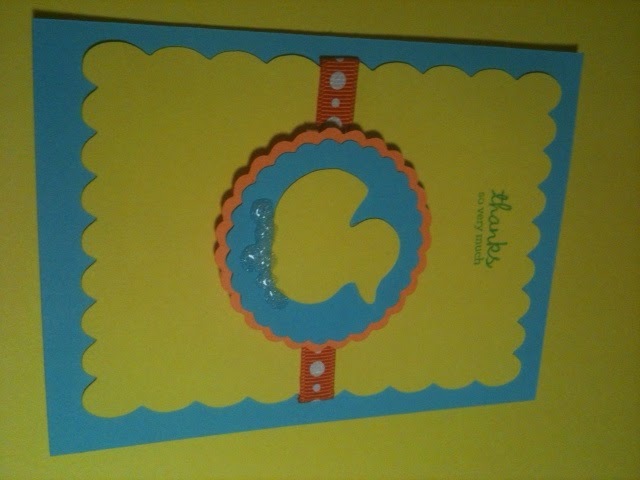 I used a 4x5.5 card and covered it with sky blue card stock cut to the same measurement. I topped it with a 3.75x4.75 yellow scalloped square followed by orange polka dotted ribbon, two scalloped circles and the duck (the circles have pop dots to give it some depth). I used my Cricut Mini and as usual, it did a fantastic job. 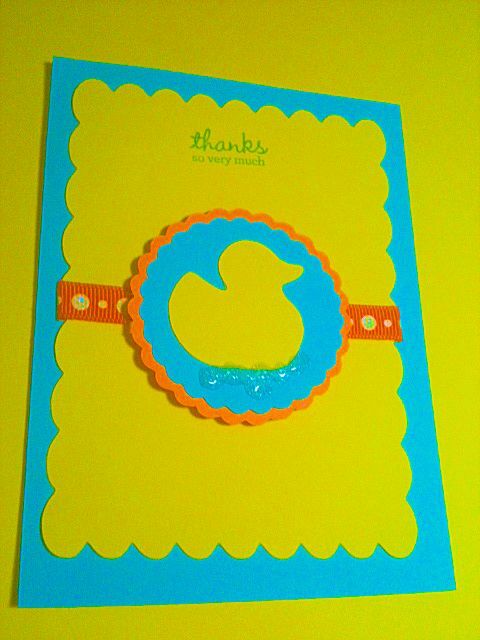 The square and circles are from the favored Cricut Cartridge Art Philosophy and the adorable duck is a freebie (one of the very few) from Cricut Craftroom Basics. The stamp is from Closer To My Heart and it is from the Petite Perks. I used Stickles to duplicate the bubbles. I only wish my iphone camera had a flash so this picture would do the card justice! My apologies and when I can edit this with a shot from my real camera, I will. That card is adorable. I love the little Stickle bubbles. He's just floatin' around having a good time! 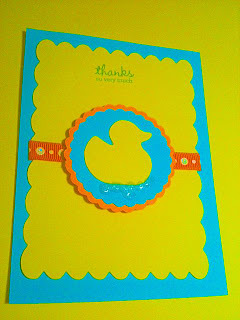 Christie, your card is just "ducky"! :-) TFS!